Cheffins are holding their annual auction sale of vintage and classic tractors on Saturday, 18th August 2007. This is a sale, which is now in its 10th year and is well established in the tractor preservation movement. 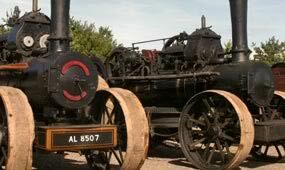 Cheffins auctioneers based in Cambridge are the UK's leading auctioneer of steam engines and historic vehicles, in particular vintage and classic tractors. These auction sales regularly attract in excess of 100 tractors together with 500 lots of associated items including stationary engines, ploughs, cultivators, spares and bygones. Cheffins are delighted to once again hold the sale at the Yorkshire Event Centre in the Nidderdale Complex, which allows the tractors and all the other sale items to be offered for sale under cover in these open fronted buildings, which are normally used for the showing of sheep during the Great Yorkshire Show. The Yorkshire Event Centre has great facilities with hard standing, good car parking and excellent facilities all round.